Possibly the ONLY use for the White Pages now that Google has taken over the world. I had a ball experimenting with string piecing over the last few days. I grabbed a copy of the White Pages, tore out a couple of pages and stitched some fabric strips onto a square that measured roughly nine inches. Then I pressed the blocks, trimmed them to eight and a half inches square, ripped the paper out and zig-zagged down some of the seam lines with a single layer of batting on the back. After that I followed my usual process for pot holders and stitched around the perimeter, leaving a little opening, just big enough to slip a square of Insul-Brite into. I slip-stitched the opening and then zig zagged a circle in the middle to hold everything in place. They’re now in my kitchen awaiting the first test with a hot pan. I’m looking forward to using them and to seeing how they bear up in the wash. 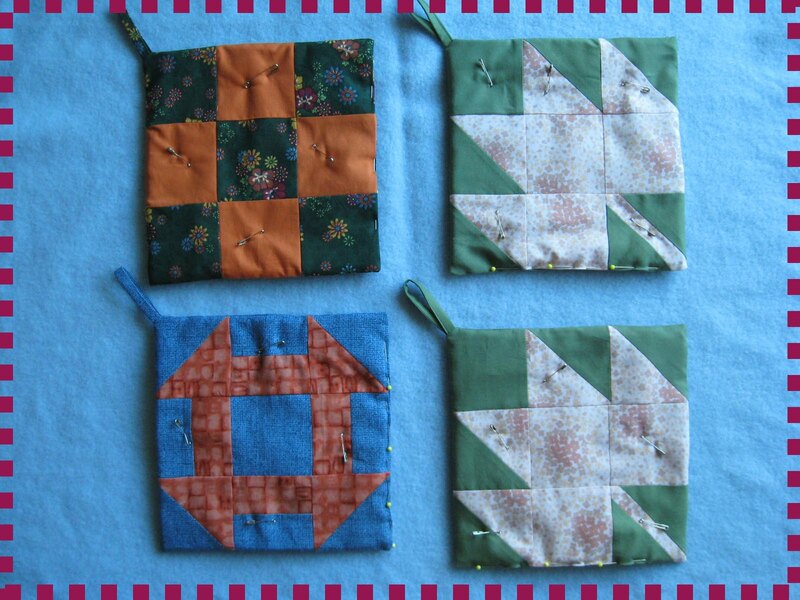 These were fun to make – I felt a bit like an improvisational quilter for a while there. I have plenty of scraps and plenty of short lengths of fabric that I’ve bought on sale, some as holiday souvenirs. 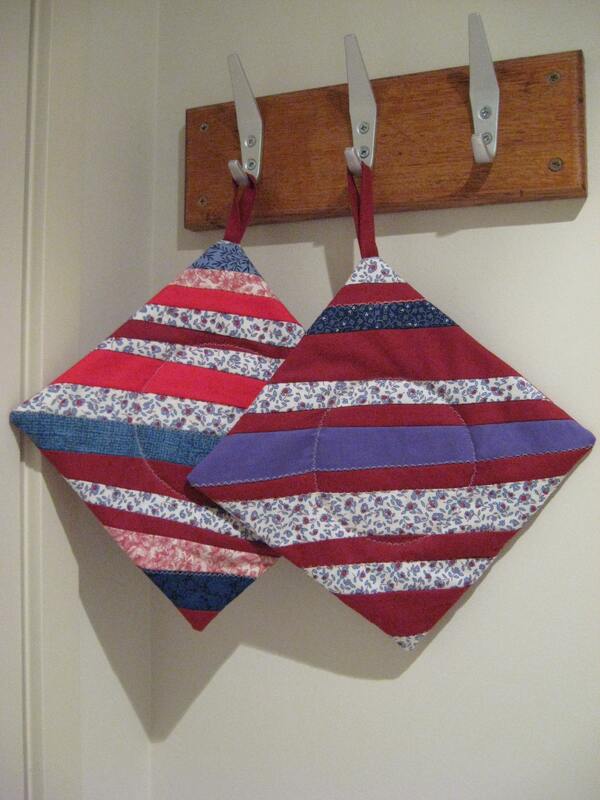 Pot holders are a perfect way to use up the scraps. Christmas will be upon us before we know and I actually could use a couple of new pot holders for myself. Remember the saying about the cobbler’s children having no shoes? Until now I’ve based my pot holders on traditional 9 inch blocks, my absolute favourite being the churn dash. However, after measuring a much loved (and almost worn out) pot holder from my own kitchen I decided an 8 inch block will work fine. About.com Quilting has these cutting instructions for an 8 inch block called Sarah’s Choice. It’s a pretty block. Just wish my points had come out a bit sharper. I’m not entirely convinced I made the right fabric choices either. Another idea to use up scraps is piecing some strips together. This tutorial at Fresh Lemon Quilts is a great stash-busting idea that uses a seven inch block. The tutorial provides a pattern but I would take a more improvisational approach, using string piecing on a foundation block. I do wonder if a seven inch block is big enough. My hands aren’t big but I do want them to get a good amount of protection when dealing with heavy objects that are hot from the oven. The Sawtooth Star block let me showcase this cute heart print. Leah’s Star is another block I considered. This pattern is from Quilt in a Day. 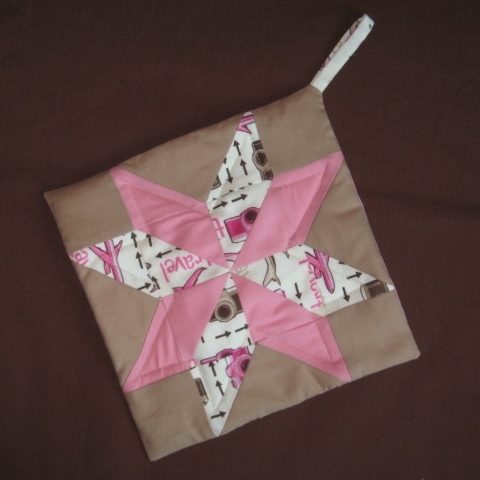 She has you sew the half square triangles over-sized and trim them down after pressing them open. That’s a new approach for me. I see the benefits of ending up with a perfectly sized square, but I am also reminded of a lesson shared by an expert photographer, back in the days when that was a passion of mine. He said, “There’s only one exposure, the right exposure.” To me, the wastefulness of deliberately making an oversized block goes against the frugal tradition of quilting. The idea doesn’t sit comfortably with me. I’m just a little too pressed for time to consider binding a pot holder just at the moment but I do concede that it gives a lovely, professional finish. Fellow blogger supermom kindly shared her very useful instructions for making hanging loops. The instructions are in the comments the follow her post about completing three hot pads. I will definitely give her method a try at some stage in the future. About.com:Quilting has a nice looking pattern for a Half Square Triangles Scrap Quilt which I’m keeping in the back of my mind for a future project. 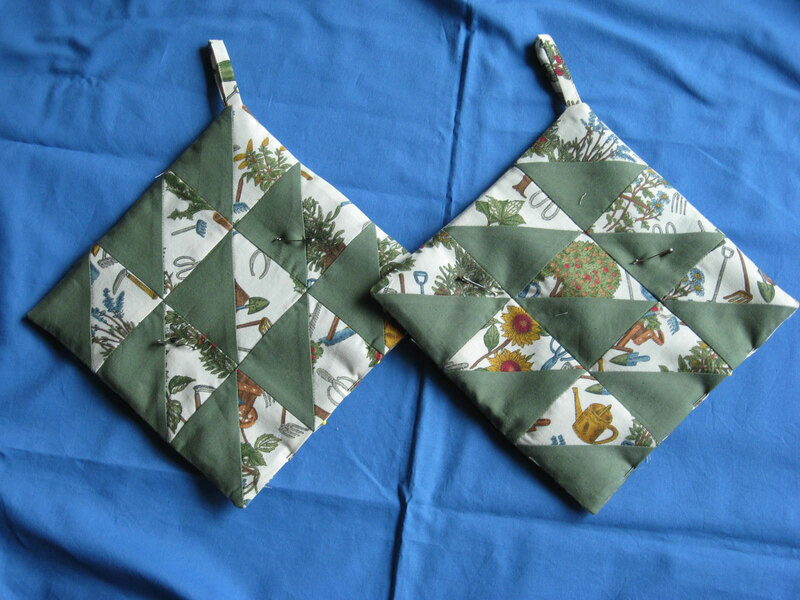 In the short term I’ve had a play with a couple of garden themed pot holders made of Half Square Triangles. These potholders are not quite complete as I still need to hand sew the opening and then machine quilt around the edges and in a central spot to keep the batting in place when the pot holders are used or laundered. To those of you who are visiting from Quilting Board, thank you for your warm welcome to the discussion group this week. I have been greatly impressed by your skill and your generosity in sharing the lessons you have learned on your own quilter’s journey. I have learned so much from you and it hasn’t even been a week yet! I’m having a change of scale today and trying to clear some space. It’s time to put in a fresh needle, change the thread colour and finish a few pot holders. The step I’m up to now is the part I like least as it involves hand sewing, and that’s not something I enjoy doing so much. It’s going to be a long time before hand quilting seems to me like a good way to spend my time, though I do appreciate the artistry and patience of those who do hand quilt. In between some baking and other home-based tasks I’ll be finishing up these 9 inch potholders, which use remnants of woollen blanket fabric for batting. As some of you may have read in earlier posts, this is an experiment, with the intention of using the excellent thermal insulation properties of wool to make sure nobody gets a burn while using these potholders. The churn dash pot holder I made a couple of weeks ago was a BIG hit when I gave it to my mother as a gift, such a big hit that she was reluctant to use it, thinking that it should really be hung somewhere in the kitchen as a decorative item. That’s nice, but they’re made to be used and my plan is that they should also wash well. On the subject of washing, I always pre-wash and press my quilting fabrics before I start cutting. I don’t have the time or inclination to hand wash them so they go in the washing machine, sometimes in with a load of clothes on a delicate cycle and sometimes by themselves. In the latter case I usually pick a wool wash setting for less agitation and a gentle spin. If 100% cotton fabric can’t cope with machine washing that then that’s probably an excellent reason not to use it. The picture shows that latest work in progress.The big 9 1/2 inch squares are the reverse side. I’ve chosen bold colours and prints because I like them and because pot holders get dipped in pizza sauce and all sorts of other delicious foods from time to time. I think it’s best to go with a relatively robust print that will withstand normal kitchen use. 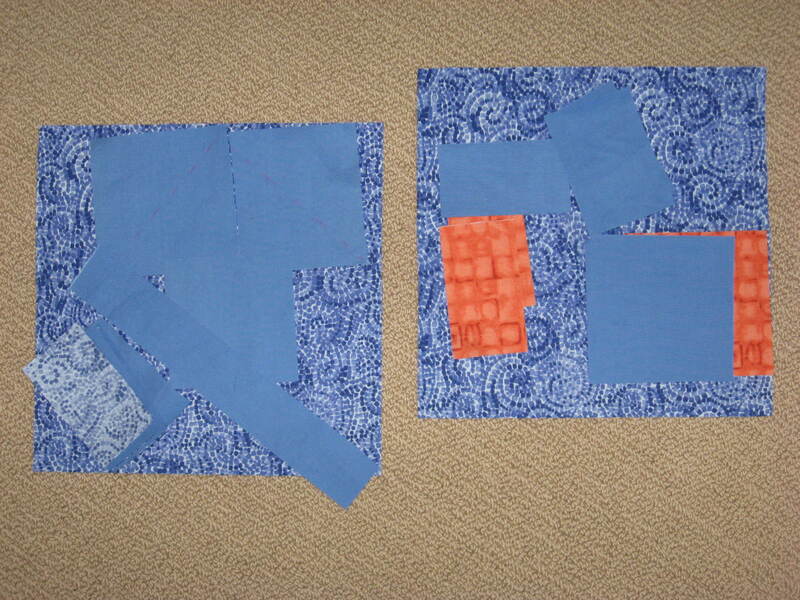 I plan to keep experimenting with pot holders as a low risk way to try quilt block designs I haven’t made before. 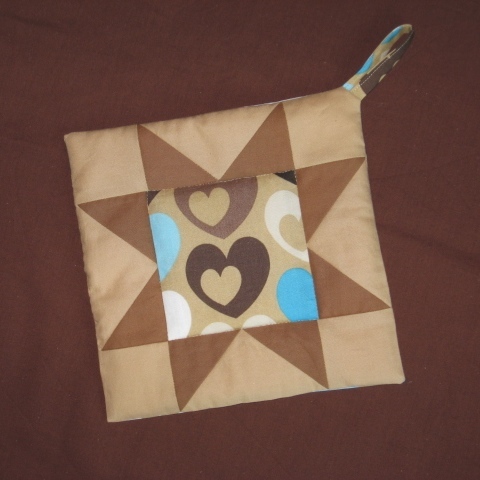 The maple leaf seems to be another quilt block classic and 9 inches works brilliantly for a pot holder. About.com is a site I keep coming back to for quilting ideas and instructions. Here are their instructions for a 9 inch maple leaf quilt block. The Block Tool iPhone app also has cutting and assembly instructions for a maple leaf quilt block, but those instructions don’t include the stalk so to me it just doesn’t look quite right. Another experiment coming up soon is woollen batting for potholders, which I plan to try as soon as I can. From time to time I drive past the Creswick Woollen Mills factory shop. They make wonderful cosy blankets out of wool and alpaca which I have bought for myself and as gifts for overseas friends. The factory shop often has a box somewhere of blankets with holes, assorted offcuts of blanket fabric and suchlike at very reasonable prices. As wool has excellent insulation properties I think it would make an excellent batting material for potholders. At the next opportunity I’m going to buy one of those offcuts and give it a try. Stay turned for a report on how that goes.